As we speak, the Christian Heritage Party of Canada has not yet had much success in the Province of Quebec. How come? And what could we do to make a breakthrough? Here is my best guess, using the metaphor of oil exploration. In order to reach "political paydirt" in Quebec, we need to bore through many layers of obstacles. Moreover, these layers appear in a definite order, and have varying thicknesses. When the Roman Empire began its decline, many citizens turned away from the traditional virtues of the Roman people. Instead of being frugal farmers and brave warriors, many just wanted to satisfy their basic bodily needs and be entertained (hence the famous saying about "bread and games", or "panem et circenses" in Latin). I claim this is the first obstacle to any political activity in Quebec: the fact most French-Canadians just want to pay the bills and have fun. 3) Second layer: the belief that "Politics is dirty"
Assuming we manage to educate French-Canadians about the nobility of human life, which far surpasses the satisfaction of basic bodily needs, we'll hit another layer: the belief that "Politics is dirty", that Politics is for liars and thieves. Another version of this mistake is the belief that there are perfectly good substitutes for Politics (for example, getting involved with Non-Government Organizations or NGOs). This is almost like saying: "I don't need to worry with brake and gas pedals and the steering wheel, I can just carefully play with the seat adjustment buttons to drive my car". 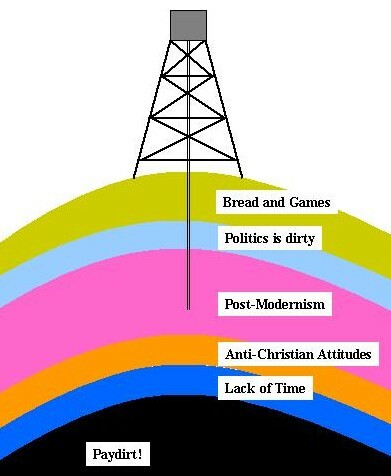 Assuming we manage to drill through the first two obstacles, we still have a huge problem: Post-Modernism. The average French-Canadian is convinced (after being brain-washed by the left-wing media all these years) that truth doesn't exist, or that we can never know it for sure. This means any political party that claims some things are really bad, and some other things are really good, is automatically rejected as being disconnected with reality. Let's assume we've managed to drill though those first three layers. Now the Christian Heritage Party will hit the layer of Anti-Christian feelings, which have also been disseminated by the media. Christianity is believed to be totally irrelevant to Politics, or even opposed to democracy and reason by its very nature. Once we're past the first four layers, the hard part is done. But we still need to drill through the generalized lack of time and money. I know several people who genuinely want to help our Country and get involved in Politics, but all of them have very little spare time. Is my analysis of the situation perfect? I doubt it, but I also think it's roughly correct. If I were in charge of the CHP "drilling rig" in the Province of Quebec, I'd start with a one-page flyer organized as a dialogue between a member of the CHP and an ordinary French-Canadian. Five layers to blast through, so the flyer would have five objections and five answers. One flyer is too short to answer all objections, so of course it would point to the CHP web site. We're poor, so it would be a plain black-and-white flyer. The media is against us, so we would go stuff those flyers directly in all the mailboxes.